We’ve all had that moment, when we look at ourselves in the mirror while trying something on, and we go “hmmm”. This doesn’t just happen with costumes, but also with standard clothing, and quite often we give in because, being a bit on the generously proportioned side of humanity, we feel it’s nearly impossible to find anything that “works”. Or worse, we’ve grown accustomed to get stuff that doesn’t fit us right -neither in size, or in style- because we feel we won’t be able to find what we want since nobody makes it. Or even worse, depending on how much of a pummelling your self esteem got, that you will never find it, because your body is the problem. Fitting curvier bodies, regardless of actual size, is notoriously difficult, because the same measurements can give vastly different bodies. This reflects in manufacturers cutting, for the most part, for an average shape, and everybody thinking their bodies are the ones with issues. And of course this results in nothing fitting anybody properly, and everybody thinking it’s their fault. 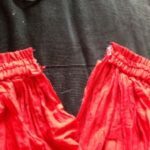 However, there are some things you can do to minimise these issues, and that will result in clothing that works better with your body and flatters you. wear the right base garments when trying on clothing: this means the right bra, and if you normally wear shapewear, those too. 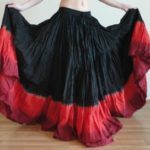 skirts that are too short (pay attention to this if you’re tall, or if you’re buying from China, as their standard sizes are quite petite in height); your dancing skirts for the most part should always be brushing the top of your feet if not longer… I like mine 2cm from the floor. A lot of people will try to tell you that what you’re experience is “normal” and that “if only you’d loose a couple of pounds” it will look better. Or if only you wore a bodystocking. Or some similar statement. These are an awful lot of “if only”s that, for the most part, are unlikely to give you the expected result (a smashing look), and personally, I’d rather not bet the several hundreds that a costume can be on such a flimsy possibility. Seriously, I’ve been told the “if only you’d loose a couple of pounds” by well meaning staff for an evening gown that I *had* to wear for a formal function; nowadays, my husband can insert two arms up to his biceps on the back of said gown while I wear it, and it still doesn’t fit right; so much for that! Never, ever settle for what you can find if what you can find isn’t what you like. Ill-fitting garments that are too short, too tight, too baggy, or too ugly, belong somewhere else -sometimes even the bin-, but never on you. If you go to a costume provider and they insist you take something that you don’t like, politely decline. Don’t settle for a folk-style garment if you were after a cabaret style, or be talked into a 2 piece outfit if you feel awkward showing off your tummy, or if the cut isn’t working for you. Try to negotiate a made to measure garment, if you have the option, or else look elsewhere, but when buying, buy only what you want, and don’t settle for peer pressure, because you will hate yourself for it afterwards, and your wallet will wail in agony too. You deserve the best you can afford, in a shape and cut that flatters you and shows you off in the best light.